Google is not good at TV – despite having more money and super-smart engineers than you can shake a remote control at, the company has always stumbled in the living room. 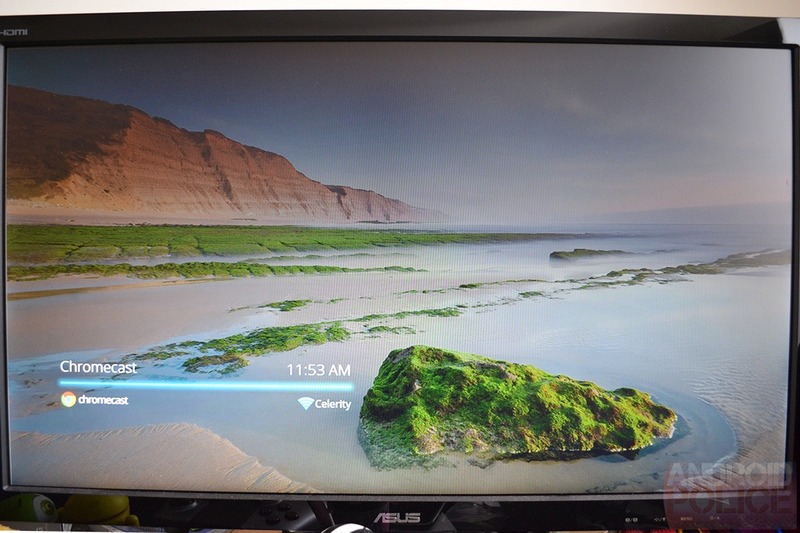 Google TV was a good idea, but it's suffered from poor support and various bugs. The Nexus Q meanwhile was killed before it even launched once someone inside Google realized it should never have been made at all. 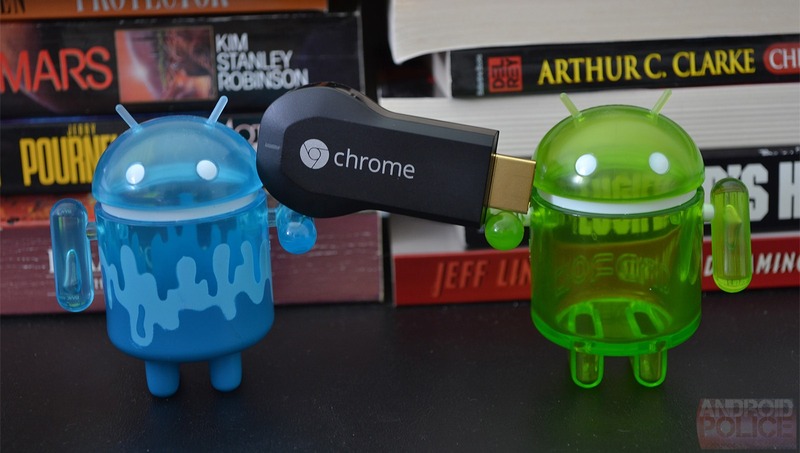 But this... the Google Chromecast, might have a shot. I've only had it for a day at this point, but it's already got more going for it than Google's previous TV products. 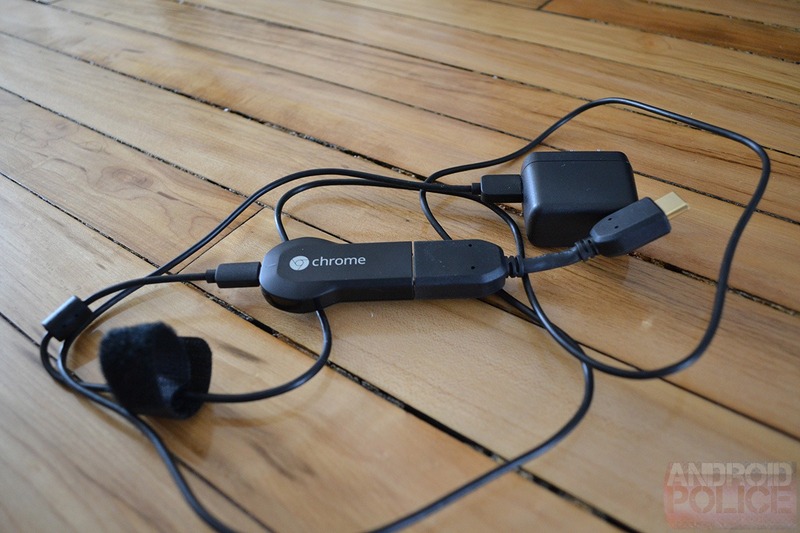 Getting the Chromecast up and running only takes a few minutes, but it's nowhere near as elegant as you might think from all the Google press images. The HDMI stick itself is slightly bulbous – it might stick out from behind your TV if you have side-mounted HDMI ports. The more bizarre part is the power cable. Google only mentioned this in passing at the event, but you have to plug a microUSB cable into the Chromecast to power it, just like charging a phone. This is included, but it attaches right to the end, making the device a little less magical. A TV with HDMI 1.4 should be able to power the Chromecast, but I don't have the hardware to test that. 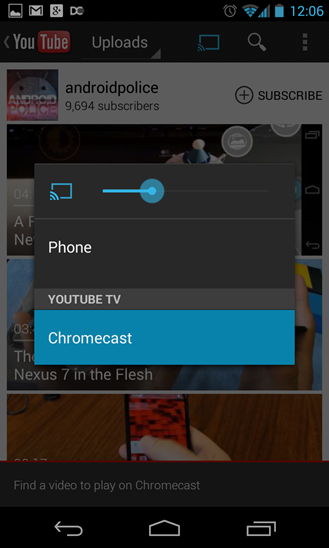 Getting the Chromecast on your network is fairly easy with the Android app. I've seen the connection fail a few times, but it always goes through eventually. Depending on where your TV is in relation to your router, you may have connectivity issues. If that's the case, the included HDMI extender may help by getting the stick away from the back of the TV a few inches. 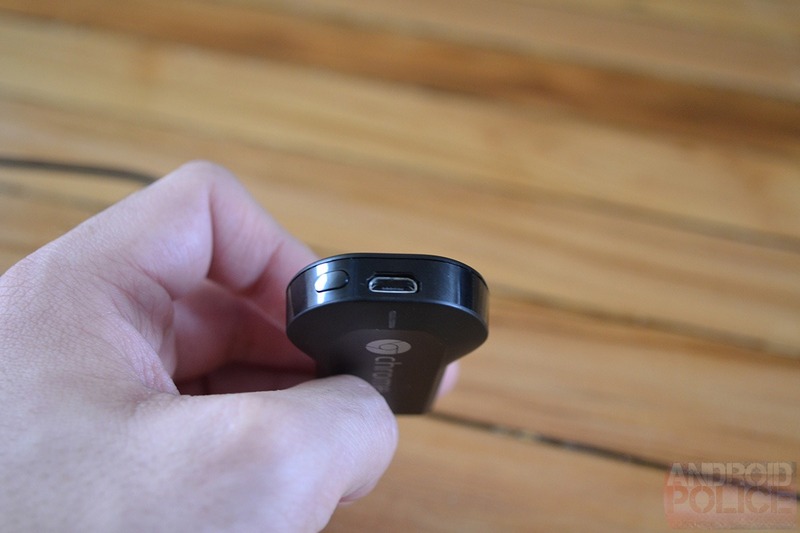 It's also useful if the rather large Chromecast doesn't fit in the port. However, the HDMI extender makes it look even more awkward. The only strange thing I'm seeing right now with regard to setup is that the Chromecast doesn't support 5GHz WiFi networks, but my Android devices mostly do. The app tries to connect the Chromecast to whatever network the controlling device is on. For me that was a 5GHz N network. The setup failed and didn't really explain why. The app also complained when I manually changed the Chromecast over to my 2.4GHz network (dual-band router) that I wouldn't be able to connect because my device was on a different network. Well, no. That's not how routers work. It still connects fine with my devices on 5GHz, but the app seems confused about this whole situation. After I got the streamer up and running, all my devices saw it automatically. There are only a few apps right now with built-in support for the streamer, but it works well. Opening something like Netflix and selecting the Chromecast immediately boots it into "Netflix Mode," then it waits patiently for a video to be selected. There's about 1 second of delay from the time I hit a button on the phone, to the time it registers on the Chromecast Netflix stream. If you've ever used the Netflix app's PS3 remote streaming functionality, this is almost identical. YouTube streaming works the same as Netflix right now. The delay is slightly shorter, and the Android app is just better in general. Part of the better feel might simply be the more responsive touch interaction on the mobile device. The all around video playback quality seems as good as any other device, but that's not surprising. 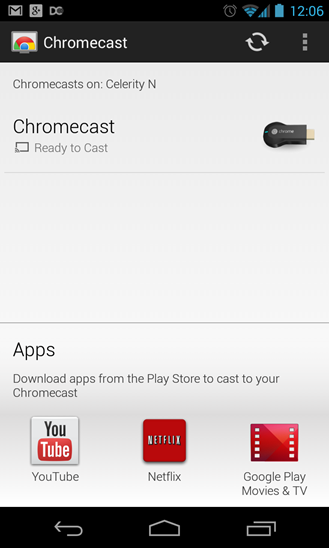 The Chromecast is pulling from the same source online, not from the mobile device. Audio from Google Play Music seems good so far. It can only play music in your online storage, though. I'm probably most intrigued by tab casting from desktop Chrome (sadly, no Android support yet). The Chromecast extension lets you project any tab right onto the TV, and the results are pretty good. There are some settings to tweak the quality level, so if you have a fast local network and solid connection, try the high-bitrate 720p setting. The other options are 480p and low-bitrate 720p. The delay is more significant – about 2 seconds. This is useful for getting video from non-supported sources on your TV. 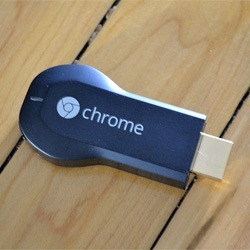 The Chromecast extension also plugs into certain websites with streaming video. So far I've seen this on YouTube and Netflix. This basically does the same thing the mobile app would – instructs the Chromecast to go out and pull down the video from the same online source. This means you should get higher quality when compared to tab casting (up to 1080p if the source supports it). The Chrome OS software is very limited, but I'm impressed with now attractive it is. It cycles through a large number of very lovely background images each time you use it. I would like to see some sort of history of casts, though. There's some wasted potential here. I am seeing one early bug with Chromecast, but not on the device itself. The Netflix app seems to be causing my Nexus 4 (on 4.3) to freeze after it opens a video, then is allowed to go to sleep. It's pretty reproducible for me, but your mileage may vary. Edit: This is possibly a Netflix and 4.3 issue, not Chromecast/Netflix. Still investigating. The Chromecast is an exciting product. Maybe I'm more surprised than I should be, but this isn't exactly in Google's wheelhouse. It is a really handy streaming device, and the tab casting is incredibly cool. This product has an interesting mix of simple, consumer-oriented features, and things for power users. And it's only $35. I'm going to continue testing the Chromecast in advance of the full review, but I'm optimistic. Google might have nailed it – finally.